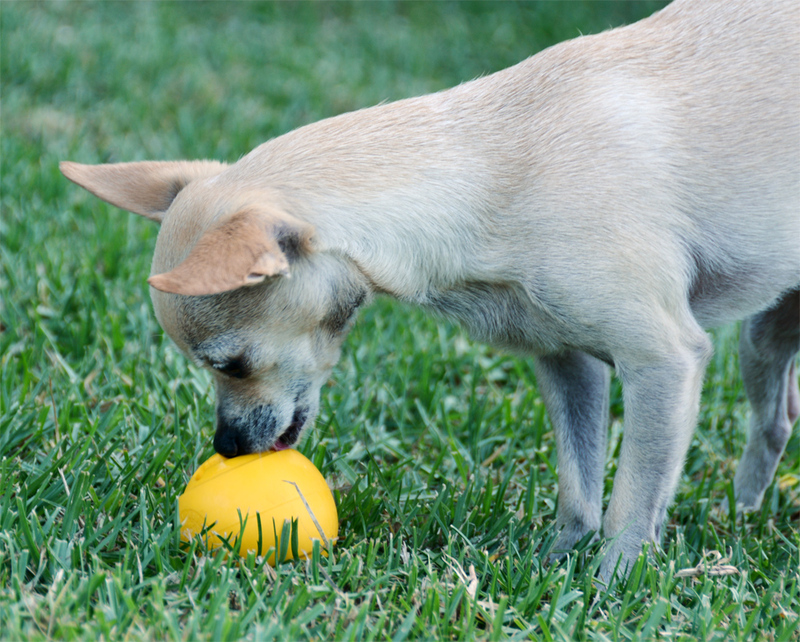 The Kong Jumbler is a large, durable squeaker toy with a tennis ball trapped inside. There are handles on either side for shaking, tossing, and tugging. It comes in two sizes, round and oblong, and two sizes. Ours is a medium round ball. We're big fans of Kong around here, but some of their more recent offerings have been a bit short on real-world functionality. Sometimes think they just dream stuff up and then put it in stores without asking questions like "In what ways could this possibly go wrong?" Fortunately the Jumbler is one of the better thought-out toys by Kong. It's not a durable rubber chew toy, this is more for interactive play or dogs who don't make it their mission in life to shred every toy. It's plenty sturdy though, and will handle quite a lot of biting and flinging. This toy reminds me of our Jolly Pets Teaser Ball, with it's eternally trapped inner tennis ball. Unfortunately, it has been nearly as big a flop as the teaser ball. Sure, it's fun to carry around and bite, but the ball within the ball doesn't seem to be adding anything. I think my dogs are too smart for this toy, they can tell immediately that the inner ball is inaccessible so they don't bother with it. Pros: Big enough for giant breeds to play with safely. Handles make it easy to bite and pick up. Squeaks and makes tennis-ball-rolling-around-inside noises. Durable enough to handle pretty much anything except a dog deliberately chewing a hole in it. Cons: Not actually a chew toy, can be gnawed into pieces by a determined dog. Translucent plastic becomes opaque with age. Bottom Line: Nobody around here is into this ball-within-ball idea. I was going through some bins in my garage when I ran across not one, but two souvenir dog outfits from Hawaii. Naturally, I decided to share them here. Brisbane's Hawaiian shirt comes from my parent's vacation a few years ago. I had forgotten about it entirely, or I would have used it to keep the sun off him after the embarrassing shavedown. It's a very light shirt that fits well, and he doesn't seem to mind it nearly as much as he minds most clothes. It doesn't have a tag identifying a manufacturer, but it appears to be from Casual Canine by Pet Edge. Sisci's Hawaiian dress was originally Oakley's dress. My elderly cocker spaniel stayed with me during my senior year of college, and my roommate brought her elderly sheltie. 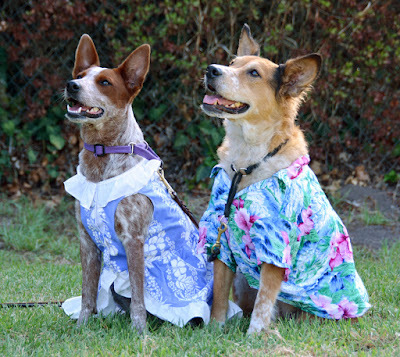 Her parents went to Hawaii and brought back dresses for both dogs that were absolutely adorable. Sisci fits in most of Oakley's hand-me-downs so she gets to wear it now. The dress is by Cocojor Hawaii, a Hawaiian company that actually makes their clothes in Hawaii. The tag says "Made in Hawaii with Aloha". It's a Lokelani Mumu in the Luau Blue pattern. Cocojor also has a daycare and boarding facility and a grooming salon. So fancy! The mumu is extremely well-made, it's probably one of the nicest dog outfits we own. I think it's amusing that these outfits were purchased by different people at different times several years apart for different dogs, and were stored in separate bins in my garage and laundry room, and I ran across both of them on the same day. All we need now is a couple of flower leis and a big chunky camera to complete the tourist look! Planet Dog's new Nooks are cute little balls made from their special Orbee-Tuff material. They come in one size and three color/shape combinations known as Peace, Love, and Happiness. These are made in the USA out of peppermint-infused recyclable material. Planet Dog guarantees their toys 100%, though I have yet to test this because all of my Planet Dog stuff is apparently indestructible and awesome. These are very solid balls, we don't have anything like them. They are basically solid rubber with a design cut all the way through. Ours is Happiness, the yellow smiley face ball. The design makes for several nooks in which to hide treats. Planet Dog says this ball is for dogs of all sizes, but I disagree. Slightly smaller than a tennis ball, the Nook presents a choking hazard for large dogs. As a child I read a James Herriot story about a collie nearly choking to death on a small ball lodged in its throat, and have been paranoid about it ever since. I'm fairly certain this ball is big enough to be safe for Brisbane and Sisci, but I certainly wouldn't have a dog bigger than 50lbs playing with it. Pros: Cute and smells nice. Bounces and floats. Can be stuffed with peanut butter or have small treats shoved into the smiley mouth. 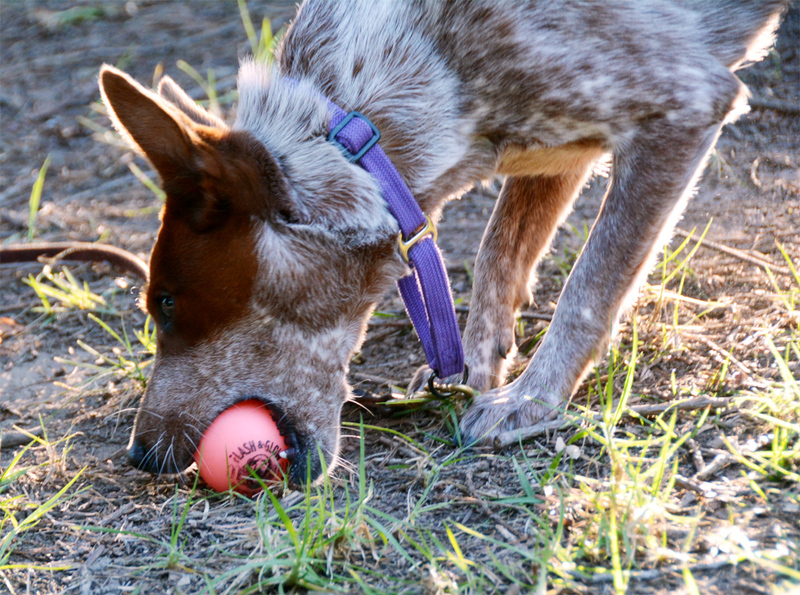 More durable than a tennis ball, and easier on the teeth. Fits in the opening of a different Planet Dog toy for a bigger challenge. Cons: Not durable enough for serious power chewers. Does not fit more than 3-4 treats at a time, and if wedged firmly enough a motivated dog might tear it apart to get them. Too small for most labs, goldens, and shepherds to play with safely. Bottom Line: It's a cute addition to the toybox, and the small, narrow cavities mean that the dogs spend a lot of time and effort to lick out a very small amount of peanut butter. Nutrisca now has Raw Freeze Dried Bites in addition to their kibble and canned foods. These little squares are made with either chicken or beef, including bone and organ meats. Other ingredients include apples, peas, cranberries, and of course chickpeas. Nutrisca is all about the chickpeas. Dogswell was founded in 2004, and I first became aware of their food a couple of years later. When I was trying to get Brisbane to lose some weight I was still doing a lot of raw feeding, but I wanted to use kibble as training treats. Nutrisca's foods were just becoming available in my local stores and so they were being heavily promoted. I could get a 1 lb sample bag for $2, and it was being advertised as good for fat dogs with its low glycemic index. It looks like Dogswell was acquired in 2009 by TSG Consumer Partners, but they seem to be operating independently. Dogswell got their start with jerky treats manufactured in China. This led to at least on treat recall due to contamination with antibiotic residue in 2013. Despite this, the company continues to defend its manufacturing practices and insists it hold the facilities to strict standards, and uses third party testing to ensure purity. While most of the newer Dogswell products and all of their dog food is made in the USA, their website proudly states that this is only due to consumer pressure and not anything wrong with things sourced and made in China where standards are often more like guidelines. Dogswell does not own their own manufacturing facility as far as I can tell. Their canned food appears to be co packed by Simmons Pet Foods, who also produce canned food for Nature's Variety and a bunch of other companies. Their kibble is produced by Tuffy's Pet Foods, who recalled some Nutrisca kibble earlier this year for salmonella contamination. These are really dense little nuggets, much denser than Stella & Chewy's or Wysong Archetype. The Dogswell website has them listed under treats, but the package states that the food meets AAFCO standards for a complete and balanced diet. I don't think I could use them for treats, they are much too big, and crumble when I finally succeed in breaking them up a bit. I got these when Ru had a dental cleaning that included removing nine tiny teeth. He was supposed to eat soft food for a week or so, and he is ridiculously picky. He eats Stella & Chewy's most of the time as long as I don't add any liquid or put anything on it, so I figured he might be interested in these. I was wrong, he doesn't like them nearly as much. He eats these about as willingly as he eats any type of kibble or canned food, which is to say he'll eat them about half the time with no rhyme or reason why or why not. Sisci is far less picky and likes them, and Brisbane adores them as he adores all things edible. These rate five out of five stars on the Dog Food Advisor website, with no worrisome ingredients. They are only available in 5oz bags, no big bags for big dogs. Obviously Dogswell isn't really expecting anyone to be feeding these as a complete diet to anything but a super picky tiny dog. I picked this bottle of Earthbath Puppy Shampoo up at a local store because I fell in love with the Wild Cherry scent. This is a super-gentle tearless shampoo that is safe for all animals over the age of six weeks. It's probably ok for younger animals too, but I usually end up washing little babies in either Johnson and Johnson baby shampoo or blue Dawn dishsoap if they have fleas. The company offers a wide variety of grooming products, from shampoos of all sorts, to grooming wipes for every part of your pet, to waterless shampoos and scented spritzes. Some of the products have matching scents, including a Wild Cherry puppy spritz. This is one of the thickest shampoos I've encountered. It's seriously like a very thick gel, and takes forever to squeeze out the little spout. This makes it difficult to spread on the dog's coat evenly, so I usually end up with one super soapy spot. It dilutes very nicely though, I squeeze a little onto an empty bottle and then fill it up with warm water. After a good shake I've got a nice bottle of easy-to-spread diluted shampoo. Earthbath Puppy Shampoo is one of the easiest to rinse products I've used. It just doesn't want to stick in the hair, so it's great for sensitive skin and pets that actively resist getting clean. I only use a tiny bit per dog when I dilute it, so this bottle will probably last forever. 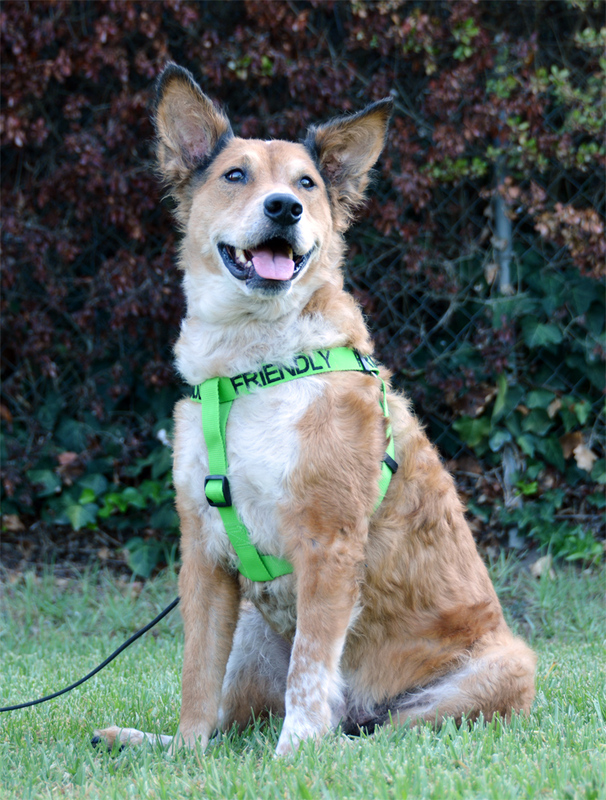 The Dexil Limited Friendly Dog Harness is a brightly-colored step-in harness embroidered in big bold letters. It is designed to convey the message from a distance and let the world know right away that your dog is totally chill and would love to visit. Dexil offers ten different color/message combinations to announce that your dog is blind, deaf, in training, working, nervous, adoptable, not ok with other dogs, should not be fed, or in need of space. 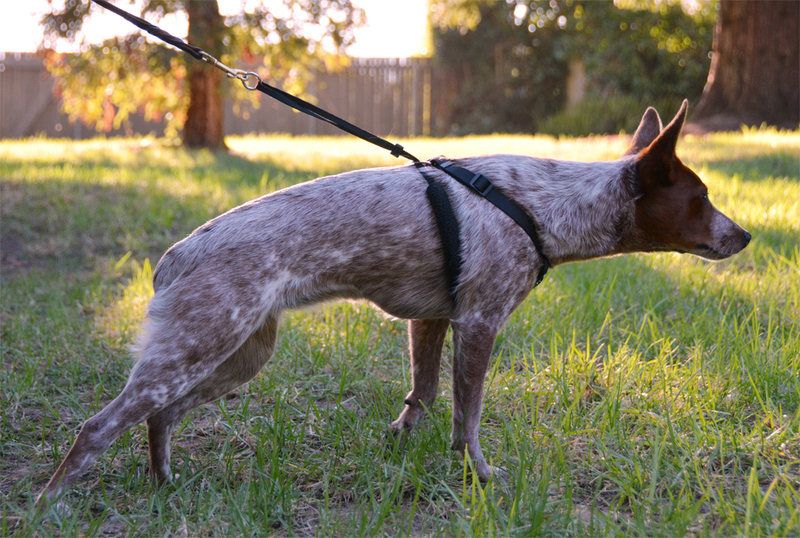 There are limited-slip and buckle collars, mesh harnesses, and long and short leashes available to match. The step-in harness is available in one size for dogs with chests 23-36" around. I've been seeing these harnesses for sale online for quite a while, and I think they're probably a good idea. The only Dexil gear I've encountered in the wild so far was a collar and leash set on a boisterous and highly active blind dog. It was a completely awesome way to let the world know why he was happily bonking into everything. 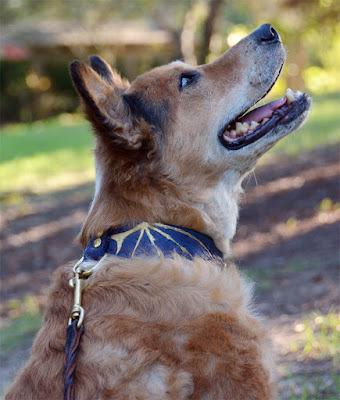 Our Friendly Dog harness was a thrift store find, and Brisbane is wearing it ironically because he's not actually friendly enough to merit making this announcement. While he is well-trained and tolerant of most situations, he can be selective about who he interacts with. He's already pretty cute and fluffy, I definitely don't need to dress him in an open invitation for the world to put their hands on him. Sisci and Brisbane could both happily wear Dexil Ltd's Caution harness. The No Dogs harness or Nervous harness would also be appropriate. What I like about these harnesses is that they are super easy to read. The width of the straps and the font makes the message clear at a glance. The collars are even wider, and it's nearly impossible to mistake the simple print for a decorative design. Pros: Very adjustable. Bright and easy to read. Sturdy and high quality. Cons: Some messages may be prone to misinterpretation. Does "No Dogs" mean you can totally pet my dog? Does "Nervous" mean you should try to make friends with her? Am I more liable than usual if my dog is wearing this Friendly Dog harness and bites someone? Also, the big long straps between the buckle and the leash rings tends to weigh down the top of the harness and make it slide to the side on smaller dogs. Bottom Line: If I had a deaf or blind dog I would definitely get them a whole set of Dexil gear. I could definitely see using the "Caution" and "Training" gear, too. This harness obviously belongs on a scary-looking, intimidating marshmallow dog. These 5" twists from Wholesome Hides are a great way to occupy the dogs for a while. These are nice little rawhide chews that can easily be finished in one sitting, making them less likely to start fights or stress out my resource guarders. They are made from heavy, thick rawhide that takes a lot of work to gnaw, and made in the USA from fresh hides so they are extra-tasty. Good For: Small dogs that chew with low to moderate intensity. Medium-sized dogs that chew slowly and carefully. Dogs that would rather gnaw than swallow big chunks. Dogs who don't enjoy swallowing treats whole. Not Good For: Big dogs. Intense chewers. Dogs that like to swallow treats and chews whole. How Much We Like Them: Enough that Briz and Sisci will focus and gnaw until they're gone. Bigger rawhides are only for crate-time, otherwise I have to take them away when the cattledogs are done chewing. They're not seriously aggressive resource guarders, but they both clearly worry about their precious rawhides and run over to check on them when they think another dog might be nearby. Hero Super Sonic 215 discs are 8.5" in diameter and made with dogs in mind. These are made from Hero's K-9 Candy material, a translucent plastic that is light and easy on mouths. They come in several different colors. 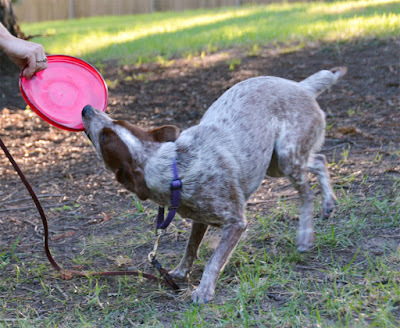 All of Hero's dog discs are made out of a special type of plastic that doesn't shatter or splinter when chomped. Instead it just develops tooth holes. This means that softer discs have a limited lifespan, our Pup 120 discs are currently full of punctures. The K-9 Candy material has held up great though, and our Super Sonics still look brand new. One of the cool things about Hero is that they sell imperfect discs for half price. The most common blemish involves the stamp on the disc coming out wrong. This is purely a cosmetic issue, and makes for some very affordable discs. I got these for $6 each and they will probably last forever unless Sisci develops a lot more bite power. Pros: Flexible enough to play tug with, and for Sisci to pick up off the ground. Tough enough that none of ours have holes yet. Blems are significantly more affordable than perfectly stamped discs. They come in pink! Cons: Not tough enough to be used as a chew toy, these are still interactive supervision-required toys. Bottom Line: Hero goes to great lengths to describe how their discs fly, which probably means I need to get better at actually throwing them further than the length of my tiny yard. Brisbane had a massive allergy bloodtest that gave us some interesting results. I already knew he reacted to chicken, turkey, duck, and eggs. The test also identified corn, barley, and sweet potatoes as potential allergens. This is pretty strange, and also makes our lives a little more interesting. It is very common for dog treats and food to be wheat-free and corn-free, but the ones with grains tend to have barley instead. Grain-free foods and treats often use a lot of sweet potatoes. Little Chewzzies moist training treats by Emerald Pet contain barley. Zukes Mini Naturals and Skinny Bakes also have barley, but their Lil' Links and Genuine Jerky treats are still ok.
Wysong Dream Treats and their Epigen, and Archetype, foods contain barley grass, and their Anergen food also contains sweet potatoes, but their Anergen 2 food is still Briz-safe. Zoe Pill Pops, more barley. Glad I checked that while I was ordering more. Alaska's Puppy Love Wild Salmon Jerky Treats, Wonder Nuggets, Wagatha's Maple Bacon Biscuits. Barley, barley, and more barley. Fruitables Skinny Minis are made primarily out of sweet potatoes, while their Crispy Bacon Apple treats are full of barley. Beastie Bars are made with sweet potatoes. All the cute little biscuits from Isle of Dogs are made from barley. Cloud Star Tricky Trainers are full of barley, but their Buddy Biscuits are still good. The one poultry-free flavor of LeanLix Lickable Dog Treat is the sweet potato flavor. Natural Balance L.I.D. Sweet Potato and Venison Formula Treats and kibble and canned foods, for obvious reasons, but their Rabbit and Potato food is still ok.
PureVita's Salmon and Peas Entree is made with sweet potatoes. Happily their Venison and Red Lentils Entree is still Briz-safe. Merrick Backcountry kibbles contain sweet potatoes, but their grain-free canned options are ok. Solid Gold's one formerly Briz-safe food, canned Hund n' Flocken, is full of barley. All but the lamb flavor of the Party Animal canned foods contain sweet potatoes. Our old staple food, Acana Ranchlands has yams in the ingredients list, but Pacifica and Singles Pork and Squash are still good. Missing Link Ultimate Skin and Coat Supplement contains barley grass, but Mirra-Coat's skin and coat supplement is ok. The last Taste of the Wild variety that I still fed Brisbane, Pacific Stream, has sweet potatoes. So does I and Love and You's Simply Sea recipe. I really love Honest Kitchen's dehydrated food, but their Love recipe was the only Briz-safe option and that has sweet potatoes. Fortunately they've just added fish-based limited ingredient Brave which is also sweet potato-free. I bet it smells like fish. Evanger's Meat Lover's Medley is no longer an option for Brisbane due to sweet potatoes. Neither is Canidae Pure Land, but I wasn't planning on buying that one again, as they never did send me a replacement bag like they said they would. There are still a few foods and treats that Brisbane can still have, but no wonder he was so itchy! The Sporn Non-Pull Mesh Harness is designed to discourage pulling by tightening when pressure is applied. It is highly adjustable and nearly escape-proof. Available in black and red, it comes in four sizes to fit dogs with necks 8-33" around. Does this look exactly like the Yuppie Puppy No-Pull Mesh Harness? That's because they're by the same company. In fact, it looks like they've finally combined their brands and now the Yuppie Puppy stuff is being sold as Yup! By Sporn. I kind of like that, it sounds like the opposite of 'nope!'. This harness works by concentrating pressure onto the cords running under the dog's armpits. It's kind of like wearing a backpack with thin straps, that just keeps getting heavier. It loosens up nicely as soon as the dog stops pulling, and seems to be a lot more intuitive for them than a choke chain. This is one of my favorite products to use as a bandaid for a pulling problem. Ideally everyone would train their dog to walk nicely on leash, but some people just want an instant fix, and others need to be able to control a strong dog for safety. A lot of dogs seem to figure out how this harness works right away, and it's only mildly aversive so it won't leave a sensitive dog screaming in pain as Sisci is demonstrating in the picture above. Because it's not terribly aversive, when no actual training takes place many dogs still pull a bit in the Sporn Mesh Harness. They don't pull as hard, but the discomfort increases as they pull harder so most just find a balance that involves a bit of leash tension. When actual training takes place, the Sporn harness can be used to change the picture for a habitual puller and help them feel the tension they've become desensitized to on their regular walking gear. 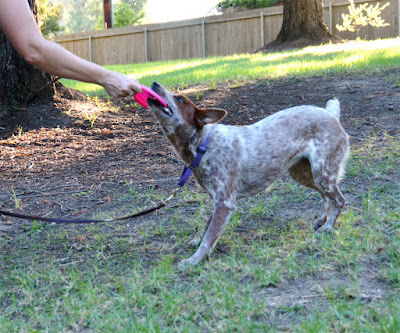 Pros: An easy fix for dogs that pull on walks, also good for training loose leash walking. Can help a small person control a large dog. Difficult to escape. Does not appear to cause acute discomfort. Cons: Rubs the armpits of sensitive dogs. Less effective on fluffy dogs. Tangles up easily when putting it on the dog and easily confuses the less spatially-oriented among us. Leaving the harness on the dog without a leash doesn't work well. Bottom Line: At around $20 new, this harness is worth a try. For really fluffy or very strong dogs, I would choose the original Sporn Halter as it provides a stronger sensation. Sisci Godzilla is one year old today! Look what a good puppy she is! 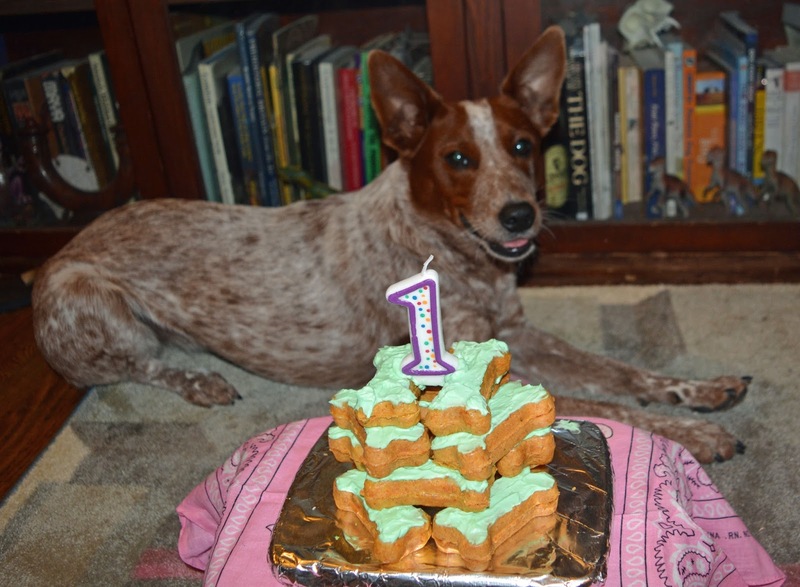 I had to hold Brisbane still for his first birthday picture. I finally got around to trying out the dog treat maker my mother gave me last summer. It bakes four bones at a time, in about ten minutes. It's basically a dog-biscuit-waffle maker, and mine really, really came out waffley. These are made with tapioca flour, beef-and-vegetable baby food, canned parmesan cheese, and plain yogurt. They came out kind of cheesy with a slightly crunchy outside and chewy inside. My friend Liz who hangs around on my couch, brings the dogs french fries, and suggests we taste dog treats, tried a couple and found them quite tasty. She likes to bite fingers and says these have a similarly satisfying feel. Make of that what you will. After baking, the bones cooled down in about 20 minutes and I was able to frost them. This is just plain whipped cream cheese with a few drops of food coloring. I was going to add sprinkles but someone has eaten all my dessert-decorating supplies. I think the resulting tower of bones came out pretty cute, and the dogs really loved them. Even Ru ate a whole one. Sisci is almost a year old and she still isn't spayed. This has come as a shock to a number of coworkers and acquaintances, as common practice around here is to spay or neuter puppies at six months. All the reputable shelters and rescues fix puppies and kittens before adopting them out, which often means pediatric spays and neuters. The general rule for "old enough and big enough" is two months and two pounds. The current practice is a very good thing, as early and extensive spaying and neutering helps prevent unwanted puppies and kittens. I am absolutely on board with the general public thinking that altering their pet before it is capable of breeding is just "the right thing to do". I think 'oops!' litters and poorly-planned breedings may be the primary source of unwanted pets. Spaying female dogs is particularly important because they tend to go into heat for the first time before they hit one year old. Heats are weird. A girl puppy in season for the first time doesn't really know quite what's going on, so she feels weird. The hormones fly, and any other dogs in the household also act weird. Even the spayed and neutered dogs act weird. Also, dogs in heat dribble discharge which is gross. The easiest way to avoid all the weirdness is to spay the dog before she goes into heat. So why wait? 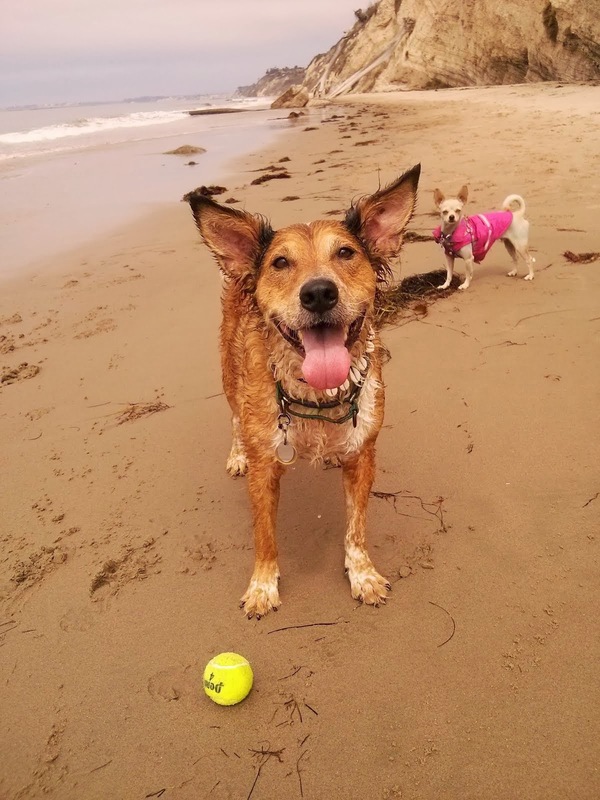 I am planning to do dog sports with Sisci, and the case for spaying versus not spaying is a little different when it comes to canine athletes. Altering a dog changes their hormones, specifically it delays the closure of the growth plates in their long bones. This is a very interesting phenomenon, as the result of the extended growth period is longer and more slender bones. Dogs that are fixed before they finish growing end up taller and lankier. This makes me wonder just how short and thick Brisbane, neutered at three months, would have been had I waited. I'd like to let Sisci finish growing and maturing before spaying her in order to reduce her risk of injury. 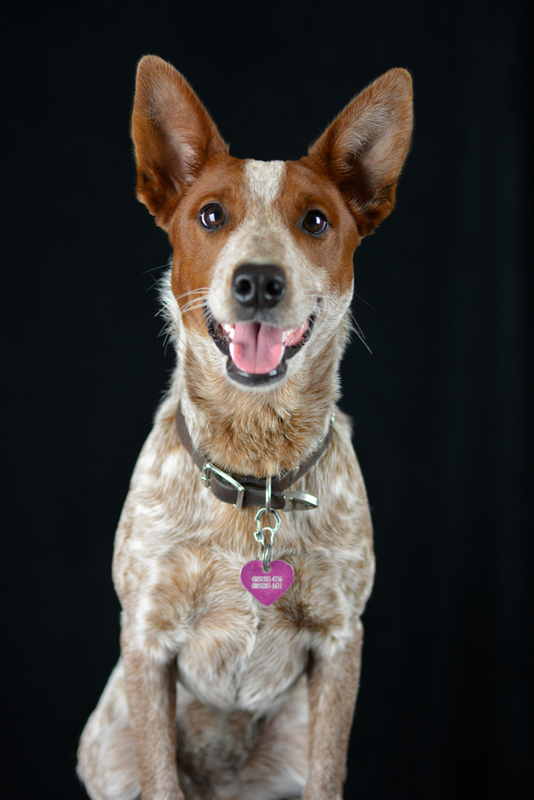 Australian cattle dogs are particularly well-known for injuring the anterior cruciate ligaments in their knees, and Sisci's mother was recovering from a knee repair when she became pregnant. 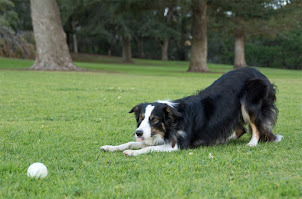 There is some evidence that spayed and neutered dogs are more prone to ACL injuries. It's not as big an issue for the average pet dog, but for a high-level canine athlete it may be worth it to delay spaying. We've already been through Sisci's first heat cycle and it wasn't too hard on any of us except for Ru who was determined to sire some cattlehuahuas despite having been neutered five years ago. I am not concerned about an unplanned litter because I am careful to the point of maybe being a little crazy about keeping Sisci away from potential suitors. I do not own an intact male dog, so I can't have an accident with an unlatched crate or baby gate. I usually walk my dogs on leashes, and always kept Sisci leashed when she was in heat. I do not leave my dogs unattended outside, so I am not worried about a roaming male digging under or jumping over my fence. It feels a bit weird to not be doing "the right thing" and getting her spayed right away, but this is a choice I'm comfortable with. I still think that pretty much everyone should get their dogs fixed to help avoid accidental litters, and I'll willingly state that most people including Sisci's breeder aren't prepared to handle the challenge of owning intact dogs of opposite sexes. I'll be looking into spaying Sis when she's closer to two years old. 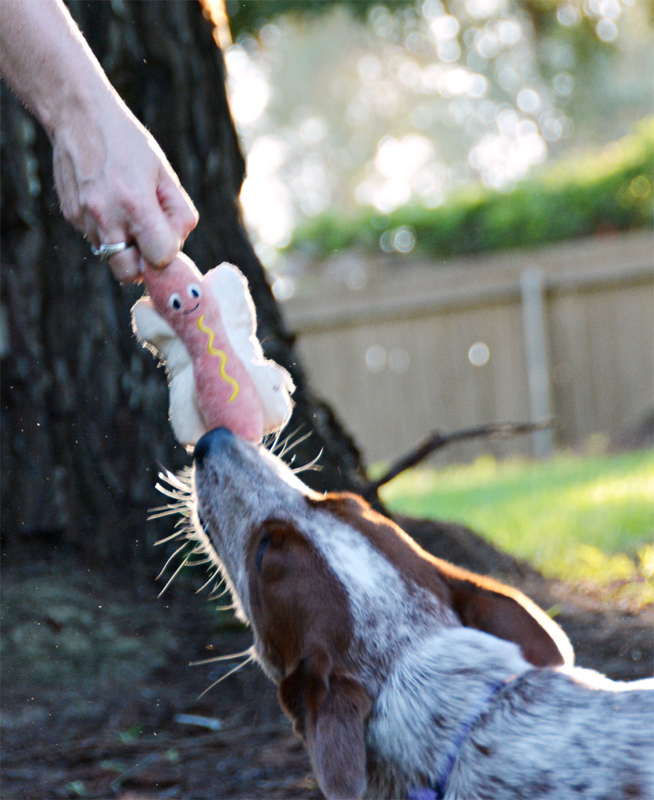 This plush hot dog toy by Simply Fido arrived in our summer-themed August BarkBox. I'm not normally a fan of gratuitous faces on toys, but this thing is pretty cute. It has a rope running all the way through it for tug games, and it squeaks. This toy is made from sturdy canvas. One thing I've learned about dog toys is that the cheap stuffies with ropes attached fall apart almost immediately. The ropes provide a good grip, and if they are only sewn in they rip out as soon as any pressure is applied. Happily, this is not one of those cheap stuffies. The rope runs all the way through it, so when I hold one end and Sisci grabs the other and starts tugging, the hot dog can handle it. That's why it's still around two months later. This little thing has been through a lot. 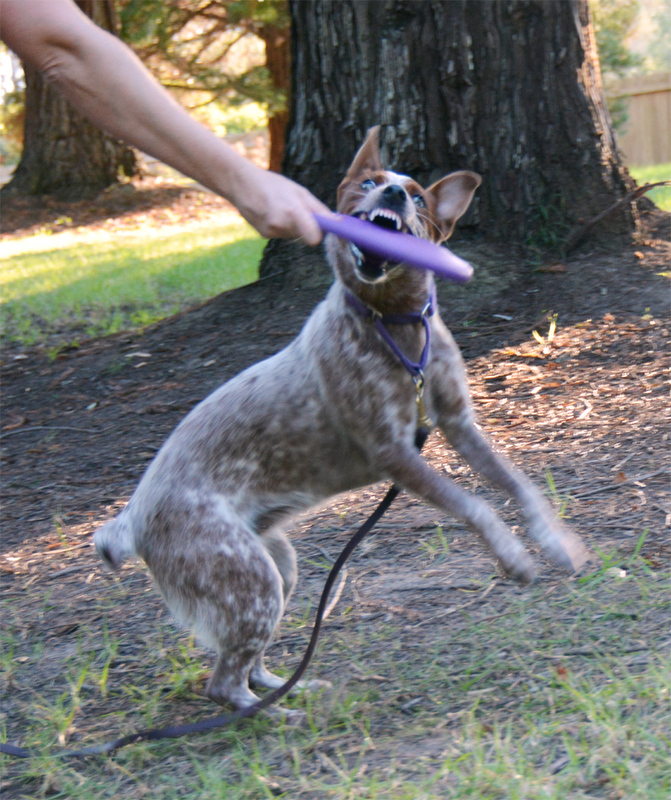 You see, Sisci is a typical mouthy cattledog, and she loves biting things. 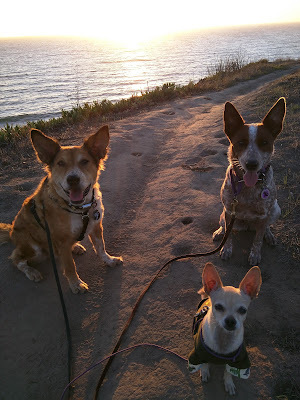 Australian cattle dogs say 'I love you!' with their teeth sometimes. The best defense against a bitey cattledog puppy is a toy to cram in their mouth every time they open it. Do this enough times and they eventually grab a toy themselves before running over to play. particularly feels the need to carry something with her every time she goes outside. The Simply Fido hot dog is definitely a favorite for this purpose. However, Sisci usually comes back into the house empty-handed (empty-mawed? ), so our toys tend to migrate out into the yard where they remain until I gather them up and wash them. The hot dog rope has been left outside in the sun and dirt for several days at a time, gotten absolutely filthy, and gone back to looking brand new after a trip through the washer. It is machine washable and has not split open or otherwise become a target for unstuffing. Pros: Sturdy enough for games of tug since the rope runs all the way through it. Machine washable and cleans up nicely. Doesn't contain a ton of stuffing. Cons: Pastel colors start looking dirty very quickly. Has a stupid face for no reason. I hate stupid gratuitous faces on things. Bottom Line: It's not a toy I would have picked out myself, but Sisci thinks it is a welcome addition to the toybox. Good For: Mid-value training treats for non-exciting training at home with minimal distractions. The dogs will eat them and even work for them for a bit, but get tired of them pretty quick. Not Good For: Dogs with barley allergies. High-value training treats in distracting environments. Extended training sessions with lots of rewards. How Much We Like Them: Enough to use up half the bag before taking a picture of them. Significantly less since learning that Brisbane can't have them, as he is my bottomless pit and head treat-snarfer. The Jawz Hyperflex Disc by Hyperflite is a tough but flexible disc made from food-safe materials. It is intended to be a happy medium between a soft, flexible disc and a tough, puncture-resistant disc. It is a purple matte color that is non-reflective to cut down on glare, and it does not float. This was the very first disc I bought, to see if any of my foster dogs would be interested in catching frisbees. None were, but Brisbane thought it was awesome and I've spent years trying to prevent him from leaping into the air. He's built like a coffee table with zero shock absorption and he'd only hurt himself. So the Hyperflex disc sat neglected in a drawer until Sisci came along andthought it was the best thing ever. She wasn't great at catching it though, so I kept having to retrieve it myself and eventually decided we needed some more discs. This led to the purchase of our Hero Pup 120 set and my realization that most discs aren't $20 each. Pros: Soft enough to play tug with and flexible enough for inexperienced dogs to pick up off the ground. Strong enough that it still doesn't have any holes in it despite tons of tug games. Easy to throw even for total disc novices. It comes in purple! Cons: Super expensive for a dog frisbee. Only comes in one color. Bottom Line: This is definitely a high-level competition disc rather than just for noodling around in the yard. It will, however, withstand an infinite amount of noodling so long as it is not used for a chew toy. Pet Head grooming products were created by the same people as the Bed Head products for humans, with the same non-traditional packaging in eye-catching colors and shapes. These are really fun products that go way beyond the basic shampoo and conditioner found in most product lines. With leave-in conditioner, spray detangler, and nail polish, it's sometimes hard to believe this stuff isn't for people. Until you spot the bottle that says "deodorizing shampoo" because, to be honest, I've never seen people shampoo advertised as having that particular quality. "But tell us how you really feel, Briz!" I was gifted a bottle of Dirty Talk Spearmint Lemongrass Deodorizing Shampoo, which probably means my photographer thinks my dogs are smelly. They're usually pretty odorless as far as I'm concerned, but Brisbane does get a doggy odor if he goes more than a week without a bath. I've been blaming this on his allergies. I have a really terrible sense of smell (see above disagreement on the stinkiness of my dogs) and I'm used to products with somewhat strong and distinct fragrances. The Pet Head Dirty Talk shampoo didn't smell like much of anything until I actually stuck my nose in the bottle. This means it doesn't try to "remove odors" by covering them up with perfume. This was a good shampoo. It got both Brisbane and Sisci clean and didn't irritate Brisbane's sensitive skin or leave any lingering fragrance. A few days later they still both feel clean, so there was no residue to collect crud on their coats. Their hair is soft and shiny. I've grown to love dog conditioner, and I would love to follow this up with a Bed Head conditioner. This part of their product lineup is similar to a lot of grooming brands, in that they offer eight different shampoos but only two creme rinse formulas. There are also a couple of detangling sprays, a leave-in conditioner, a deodorizing spray, and a fragrance spray. I definitely need to try more Pet Head products, or at least find them in a store and smell them. Hero's Pup 120 Discs are nice non-threatening 120mm mini discs. They are light and soft on the dog's mouth, and easy to throw straight. These are made from a dog-safe plastic that punctures rather than shatters when chomped. These come in a variety of bright colors. I knew I wanted to do dog disc sports with Sisci, but nobody local to me does it so I've been figuring things out on my own. The first thing I needed to do was get her interested in discs. I had one big one around, but Sisci wasn't so sure about it. She had never seen a disc before. 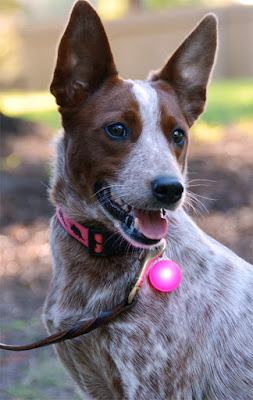 These itty bitty discs are awesome for introducing sensitive and smaller dogs to the whole concept of chasing a frisbee. The only throw I've been doing so far is a roller, where the disc rolls along the ground like a wheel. I don't want Sisci doing a lot of jumping until her growth plates have closed so she is less likely to suffer a major injury. She loves chasing rollers though! Pros: Small enough even for Ru to play with, plus they fit in the pocket of my cargo pants. Tough and flexible enough to play tug. Not too scary if it accidentally hits the dog, and not super-threatening when I wave it around. Very light, so they kind of float in the air when thrown. Affordable, at #3 each. 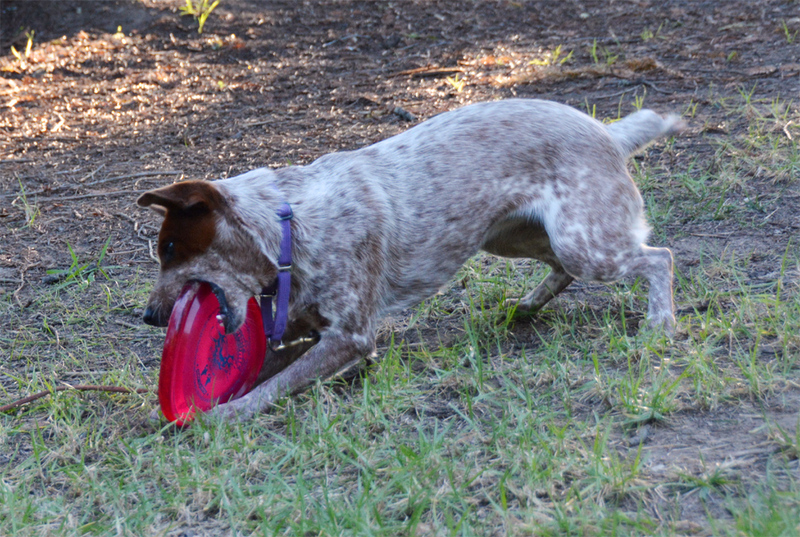 Cons: Puppy-soft discs are very easily punctured when the dog develops some confidence and is ready to really grab them. Bottom Line: I just noticed that the Hero website has a page on repairing punctured discs with a lighter. I need to try that with mine because they are now full of holes. Sisci has moved on to bigger discs, but Ru still likes the Pup 120s. Instinct is the grain-free dog food line by Nature's Variety. This company makes raw, kibble, and canned pet food using a variety of protein sources. They have a surprisingly large number of products, some of which are extremely similar to one another. We tried the venison and rabbit varieties, but not the Limited Ingredient Diet versions which look almost exactly the same. I think this may have been one of the brands of raw food Brisbane ate as a baby, but I can't even find any information about how long the company has been around so I could be wrong. Though most of the information available about Nature's Variety states they are an independent company, investor Catterton Partners appears to have bought them out in 2008. I definitely recall people having issues with ingredient changes, like pork being added to the raw rabbit food, right around that time. Nature's Variety does not have their own manufacturing facility. Their kibbles are co packed by CJ Foods in Nebraska, along with Timberwolf and some Blue Buffalo foods. The cans are co packed by Simmons Pet Food along with a ton of other brands including Petcurean, Dogswell, Ol' Roy, Canidae, Blue Buffalo, Life's Abundance, Nature's Logic, and Evolve to name a few. This is a loaf-style food that can be used in a variety of different ways. I sometimes give Brisbane his pills in a spoonful of it. Mixed with a little warm water, it also convinces Sisci to eat when she's not so sure about the kibble of the day. Both the rabbit and the venison formulas have pork liver in them, which is the major difference between the regular varieties and the limited ingredient formulas. Besides the main ingredient meat and the pork liver, they just have some flaxseed and some peas and carrots. I like the Instinct foods because they offer a variety of protein sources that work well for dogs with allergies. I'm pleased that neither includes sweet potatoes, which feel like they are in all things grain-free. Sisci and Ru both enjoyed the rabbit and venison cans, and Brisbane of course devoured everything because he loves any kind of food. Instinct canned formulas rate five out of five stars on the Dog Food Advisor site. There have been a couple of recalls for Nature's Variety raw foods, but I can't find any recalls for their canned or dry foods. I found these at Petco, so they are probably widely available. This makes them a welcome addition to our meandering rotational diet. I've known for several years that Brisbane was allergic to poultry and eggs. We did an elimination diet when he was still raw fed, and determined that he reacted very reliably to chicken, turkey, duck, and eggs. Environmental allergies were also suspected, so he has been getting Benadryl and Zyrtec to help keep those under control. Still, he has ongoing skin issues that we just can't seem to beat. A nice sunset picture just because. I finally took the big (and expensive!) step of getting his allergies tested so he can begin allergy shots. This involved a really horrendous amount of blood being drawn from his neck. I guess for most tests they just need 3-4cc of blood, but for this one they needed 12cc of just plasma so they had to take way more than that. Poor Briz needed needed some time to recover after that. Then the vet had to send his plasma off to the allergy testing lab. Several weeks later, we finally have the results. Some of them were expected, he tested positive for egg and flea allergies. Some of them were sensible, he is allergic to a variety of trees, weeds, and grasses. And some of the results were just plain annoying. Brisbane is apparently allergic to corn, barley, and sweet potatoes. Sweet potatoes. They're in most grain-free foods. I feed him baked sweet potatoes on a regular basis. Also popcorn. He can no longer share a bowl of popcorn with me. It's annoying, but between the new food restrictions and the allergy shots, hopefully he will eventually be much less itchy. This is exactly the reason I made the Dog Food Wizard. The SpotLit LED Carabiner Light by Nite Ize is a sturdy and bright beacon that can be clipped to your dog. It comes in variety of different colors including Disco, which cycles through several different colors. It has a steady light mode and a blinking mode, and can provide 20-25 hours of light before it needs new batteries. It uses two 2016 3V lithium batteries and is water-resistant. I see these things on dogs at work all the time, and a lot of them have been wearing the same SpotLit for ages so these things clearly last a long time. This is actually a multipurpose clip light that can be used for just about anything. The company, NiteIze, makes a whole ton of nifty doodads that I am prone to impulse buying while waiting in checkout lines. These include S-biner double-ended carabiners, gear ties, LED flashlights, and stretchy shoelaces. These things are very, very bright. So bright, in fact, that looking at them in the dark is a bit painful. I've been putting one on Sisci for our late-night games of fetch in the tennis court, and in full darkness it's blinding. It looks totally awesome when she's chasing a light-up ball, though. Pros: Super-bright and super-visible. Comes in lots of colors so you can put a different color on each dog. Very durable, lots of people just leave them on their dog's collar permanently. Cons: Kind of blinding when it's really dark. A bit heavy, I wouldn't want to put this on a tiny dog and I'd be careful with it on a very loose collar as it does flop around a lot. Bottom Line: This light is so effective and so popular that I don't actually see anyone using anything else. These Halloween Bark Bars by American Health Kennels arrived in our October Pet Gift Box. These are big, hard, crunchy cookies that are poultry-free and egg-free. They work well as a distraction since they take several minutes for the dogs to crunch up. Good For: Handing the dogs to keep them happy while I walk out the door. Hiding around the house for them to find. Looking awesome. Decorating with festive icing and sprinkles. Not Good For: Picky chihuahuas. High-value training treats. How Much We Like Them: They're cute enough that I'd buy them again if I saw them. Even if it wasn't Halloween. 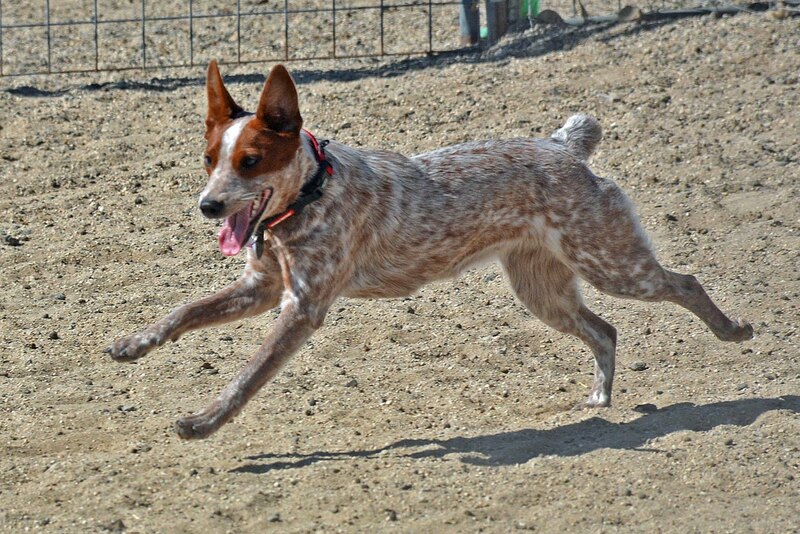 I love taking pictures of lure coursing, I always end up with the most amazing shots of dogs running intensely. The trick is to use a very fast camera, take several hundred pictures, and just choose the best ones. This is what I'm trying to capture. This, of course, means I end up with dozens are bad pictures for every good one. Sometimes I've focused on the grass instead of the dogs. Sometimes the background is full of equipment and bystanders who would really prefer not to be on the internet. And sometimes the dogs look ridiculous. Not majestic. Not intense. Not athletic. Here are some of my favorite stupid lure coursing pictures. I'm not sure what happened to Brisbane's ears here. They usually flop all over the place when he's running, but in this shot he is just holding a stay. A weird stay. This is Sisci's dad Roscoe in the least flattering part of his stride. The front end changed directions. The back end didn't. Pretty much every shot of this pointer is absolutely ridiculous. Just limbs and skin flying all over the place. And here's Brisbane running over Ru. They're both ok, it just made for a really silly picture. I spotted this gorgeous leather Dragonwing Collar by FinelyTooled on Etsy well over a year ago. I thought it was absolutely stunning, and when I had the means to get one for Brisbane I had to do it. This collar was custom made just for Briz, I chose the design, colors, and hardware. The seller does a number of feather, wing, fantasy, and nature-inspired designs, and makes dog gear, horse gear, and probably anything you can imagine. Look at how pretty this collar is! It's so nice, and every time he wears it we get comments. It's a very wide and very stiff collar, so it's more of a special occasion collar than everyday wear. I have a lot of trouble keeping hair on Brisbane's neck because everything including his tag collar rubs it off. Back in my medieval reenactment days, I did a bit of custom leather work including carving. I always intended to make Brisbane a harness but stopped doing reenactment before I got around to it. I can prepare and stitch basic pieces, but detailed carving like this is far beyond my skills. Not only did I get a kickass custom art piece for Brisbane to wear, I supported a talented artist rather than a faceless corporation. That's why I love Etsy. Pros: Custom made just for Brisbane. Heavy, high-quality hardware. Absolutely stunning. Surprisingly low price for custom work. Cons: Stiff leather tends to break in Brisbane's neck rather than being broken in. Would be totally awesome lined in felt or velvet, for which I would have had to pay much more. Bottom Line: Clearly Sisci needs one too. How Do I Get My Dog to Stop Barking at Everything? 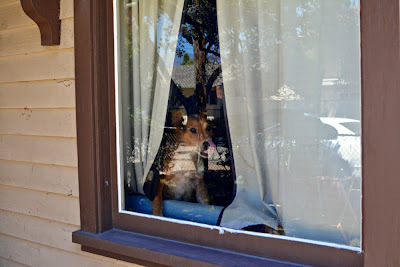 What do you do with a dog that barks at every single noise and person passing by the house? Is there a way to end all the barking without resorting to a shock or spray collar? 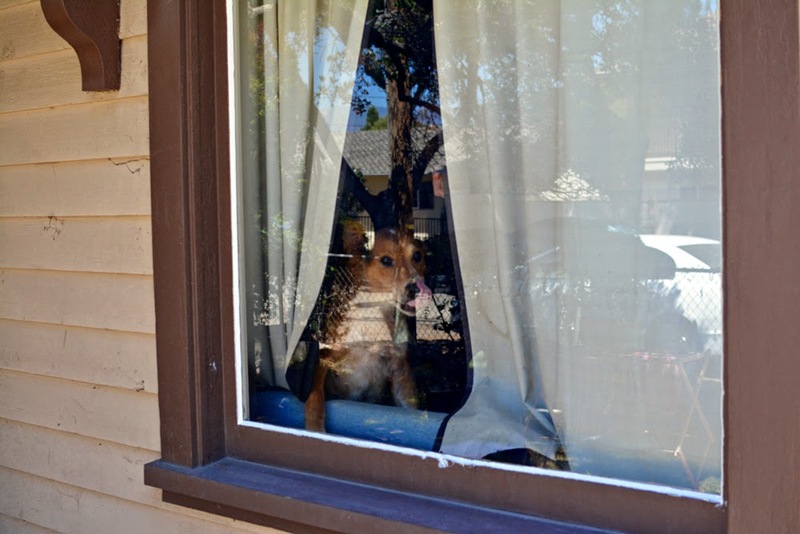 Is moving out to the countryside or finding a new home for the dog the only option? A major downside to owning high-energy herding dogs in the middle of town is their tendency to want to alert me to every single thing happening in the neighborhood. We live in a very, very busy neighborhood. It's an extremely high-density area, especially for a place where nothing is more than two stories high. Many, many people lack their own vehicle, and tons of people walk. At any given moment there are probably a couple of cars passing by, a handful of people walking, and probably a bike or two. Skateboards are the most exciting thing, loud and fast-moving, and usually accompanied by shouting. We do not have a backyard. Behind my house is another house, with a driveway running past us. Most of the lots in my neighborhood are the same way, including the one next door which actually has three different houses on the small property. This means I have a driveway running just outside the windows on either side of the house, with people coming and going all day and night. In back we have the neighbors, who spend a lot of time outside and really like to skateboard. In front we have our tiny yard surrounded by a short chain link fence, and on the other side of that is the street with no sidewalk between. All this is to say that, when we first move in, Brisbane found a great many things to bark about. Kids skateboarding down the driveway! Random person walking down the street! Leafblower! Special needs people with weird gaits from the housing project across the street! So much barking. First I tried rewarding him every time we heard a sound that I knew would set him off, but this required constant vigilance on my part and often I wasn't even certain what had set him off. When frustrated I would squirt him a squirt bottle or yell at him to knock it off, but that didn't convince him that skateboards were not the sound of impending doom. What did finally work was a solution I got from someone online that lived in an apartment with a barky dog. Their advice was to have the dog drag a leash, and every time she barked they would silently and calmly take the leash and walk the dog to the bathroom, turn on the light, and shut her in there. When she had been quiet for a minute or two, they would open the door and go back to whatever it was they had been doing. Repeat every time the dog barks until they stop barking at stuff. This worked remarkably well for Brisbane, so much that he stopped reacting to the sound of skateboards at all. He would still like to bite them when he sees them rolling, but the sound of them no longer gives him fits. Likewise, he no longer bats an eye or ear when people walk down the street and have loud and inexplicable conversations at 2am. The first day Briz barked a normal amount and I quietly escorted him to the bathroom at least fifty times before he began to bark less. By day two he was almost completely silent, and within a week he was ignoring those skateboarders like a pro. The reason why the silent and neutral time out works is because the bathroom is really boring. The fan makes some white noise that blocks out everything else, there's no window, and there's nothing to do in there. A bored dog might eventually unroll the toilet paper or tip over the trash, but for a couple of minutes most dogs seem to just chill out. If I had an especially naughty or bathroom-phobic dog, I would be doing their time outs in a different location, like a back room if they always bark at things out front, or tied to a doorknob in a hallway. I'd like to avoid using the crate because I don't want to make it an unhappy place by having to shove them in there. With the bathroom I can just walk the dog through the door and then leave. Doing nothing is a good way for a dog to chill out a little, but it's tough for them to chill when they are stressed or afraid. This is why I keep a leash on them, so I can calmly pick it up off the floor without having to reach directly for the dog when I'm already kind of pissed. Ideally, I want them to go from "look! something to bark at!" to "*sigh* booooring" without worrying that I might do something scary in between. This is important, because I am trying hard to chain their overly-excited behavior to calm chill-out time. Attaching blah, dull time to excitement behavior can help to make that behavior and its trigger less exciting. It's sort of like a rollercoaster, hear a skateboard, leave the loading area. Start barking, go up the big hill. Calmly walk to the bathroom, go down the hill and get off the ride. As the association between barking and chilling out gets stronger, the hill gets smaller. The dog goes from "I hear stuff, I bark, I chill out" to "I hear stuff, I chill out". 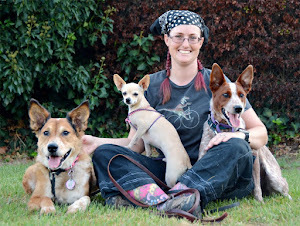 It's been a while since I've had barking issues with Brisbane, but Sisci spent her first few months on a rural property with minimal surrounding traffic and lots of space between neighbors. Coming to town with me was a big change, and she is pretty sure that the neighbors are coming to kill us all. Every car door slam, note of mariachi music, or shrieking child is cause for alarm. Often I don't even know what it is she's barking about. This evening I was especially frustrated and finally thought about how to solve the problem. I remembered what I did with Brisbane, and it has worked beautifully. So far we have made a dozen trips to the bathroom and already her big barks have become little woofs. Getting up to put her in time out over and over again will be totally worth it when she can handle the daily sounds of our neighborhood stress-free. I don't normally use Solid Gold's dog foods because the vast majority of them contain eggs, but I do use their SeaMeal nutritional supplement from time to time. Poor Brisbane is allergic to eggs, as well as chicken, turkey, and duck. Probably pollen, too. SeaMeal is a kelp-based vitamin and mineral supplement with digestive enzymes. It claims to be a good source of chlorophyll and iodine. This is an interesting dietary supplement that has been around since 1982 and is a favorite of many dog people. I came across it while looking for anything that would help Brisbane grow some hair. Even before the embarrassing shavedown, he had issues with hair loss and taking months to regrow lost fur. I am skeptical of dietary supplements as I am skeptical of pretty much everything. I like well-constructed studies and trials that show statistically significant effectiveness of things. This is why I don't give my dogs joint supplements like glucosamine, chondroitin, or MSM. Though tons of people swear by them, study after study has failed to show that they actually do anything more than a placebo. The most optimistic studies are usually small and poorly designed. Studies on kelp as a dietary supplement focus almost exclusively on iodine. Other studies tend to be on the levels of arsenic found in many kelp supplements, and the effects of that arsenic. There have been some case studies on people developing hypothyroidism after ingesting large amounts of iodine via kelp supplements. Basically the thyroid gland shuts itself off for a while if there is too much iodine in the body. I suspect that Brisbane may have low thyroid function based on his difficulty growing hair and inability to lose weight even on a very low-calorie diet with lots of exercise. Additional iodine in his diet could help with this, make it worse, or have no obvious effect. I've given him SeaMeal for several months at a time in the past with no obvious effect, but we're trying it again as he attempts to regrow his entire coat. I'm also trying to convince Ru to eat it as he is missing all the hair at the front of his neck from wearing a collar. Sisci is apparently getting everything she needs from her current diet, as her coat is so shiny it actually sparkles in the sun. Solid Gold SeaMeal has a lot of vitamins, minerals, and amino acids. I can see it being particularly useful for dogs that eat the same food every day, as it could help address unknown nutritional gaps. My dogs eat tons of different foods, both commercial and fresh, so they are less likely to have that particular issue. It's probably like multivitamins for humans, with no particular effect on anything. Somehow this has not stopped me from purchasing a 1 lb canister of it and sprinkling it on everyone's food. 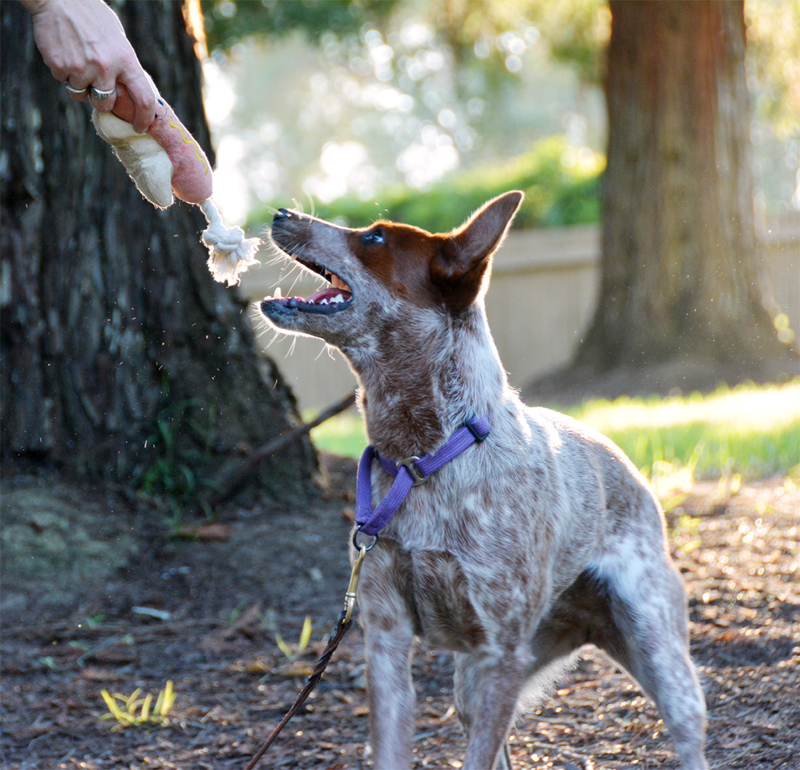 Eating too fast is a common dog problem that can be solved in a multitude of ways. From fancy gadgets to extremely lazy low-tech methods, there is a solution out there for every food-inhaler. The Outward Hound Fun Feeder makes eating a slow process. 1. Use kibble as training treats instead of putting it in a bowl. Split up meals into several training sessions each day. 2. Take a scoop of kibble and fling it as far as you can across the yard. The dog can spend the rest of the day finding it one piece at a time. 3. Hide your dog's daily meal in various places around the house before you leave for work. 4. 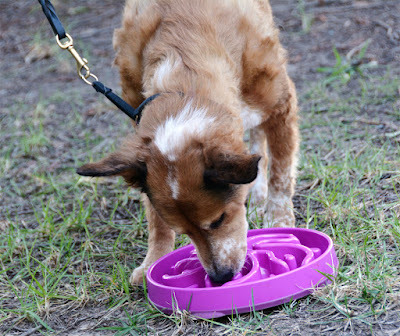 Use food-dispensing puzzle toys instead of a food bowl to make your dog think and put in some effort to get their meal. 5. Stuff canned, raw, or soaked dry food in a Kong toy and freeze. It will take them a while to empty it out. 6. Use a cookie sheet instead of a bowl. Try to spread the food out as much as possible. This works well for canned food and rehydrated foods like Honest Kitchen. 7. Put something in the bowl so they have to eat around it. There are a number of products out there for this purpose, from doodads that suction to the bottom to stainless steel and ceramic balls. This led me to wonder if a dog had ever managed to swallow one of those things. A cheaper way to try this method out is by dropping a tennis ball or two in the bowl. Some dogs just learn to pick the ball up and move it before slurping up their dinner. 8. Put the food in a slow-feeder bowl like the Outward Hound Fun Feeder. These have permanent obstacles that the dog must eat around. 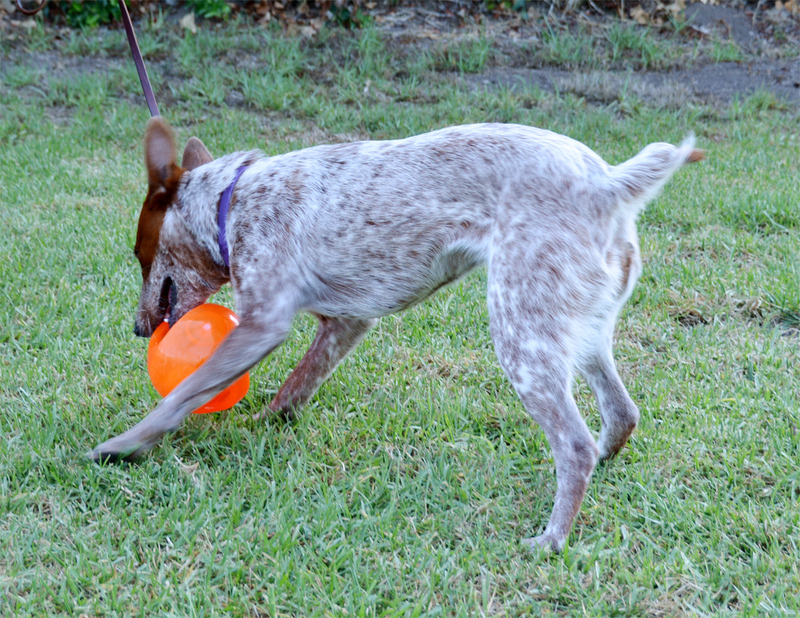 This Flash & Glow Jr. light-up ball by American Dog Toys arrived exactly one year ago in our October 2014 BarkBox. It apparently took me an entire year to use it enough to write a reasonable review. This is the smaller size of this ball, at a bit under 3" in diameter. Ours is pink, and when it hits the ground it flashes very, very bright red. It floats and is durable enough to handle being lobbed across a tennis court. 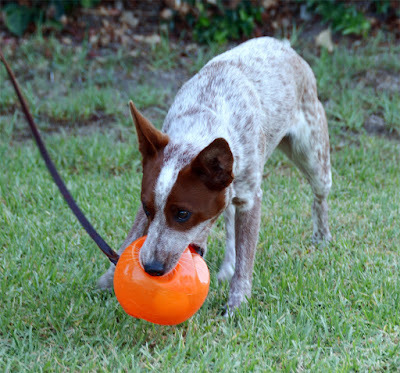 This should be the perfect ball for late night games of fetch in the tennis court. It's a little small for Brisbane, but he is very picky about balls and pretty much rejects anything that isn't a tennis ball or an Ultraball. I'm a little surprised that BarkBox sent us the smaller ball because it's almost too small for 40-pound Brisbane and our box is supposed to be suitable for dogs up to 50-pounds. The Flash and Glow Jr. ball is surprisingly heavy and hard, which might be part of why Brisbane doesn't like it. It's tough plastic without a lot of give, and it doesn't bounce at all. As advertised, the ball does flash and glow, very brightly. In fact it is so bright that it destroys my night vision and hurts my eyes. I have to try very hard not to look at it directly and I wonder if the dogs feel the same way. Pros: Very bright and highly visible. Smaller than a tennis ball so better for small dogs. Super durable, nobody has bit through it yet. Floats. Can handle being thrown forcefully on cement repeatedly. Cons: Extreme brightness is not ideal for total darkness as all you will see for a while is the spots in your vision. It's like looking at the sun. Very hard, hurts the dogs when they get hit accidentally in the dark. Bottom Line: Not bad for dusk, but after hitting Sisci with it during a totally blind game of fetch I think I will look for a softer and dimmer ball. Good For: Dogs who will eat literally any type of food. Low value training treats. Hiding around the house for the dogs to discover. Stringing on wearable edible dog necklaces. Balancing on dog heads while practicing our leave-it command. 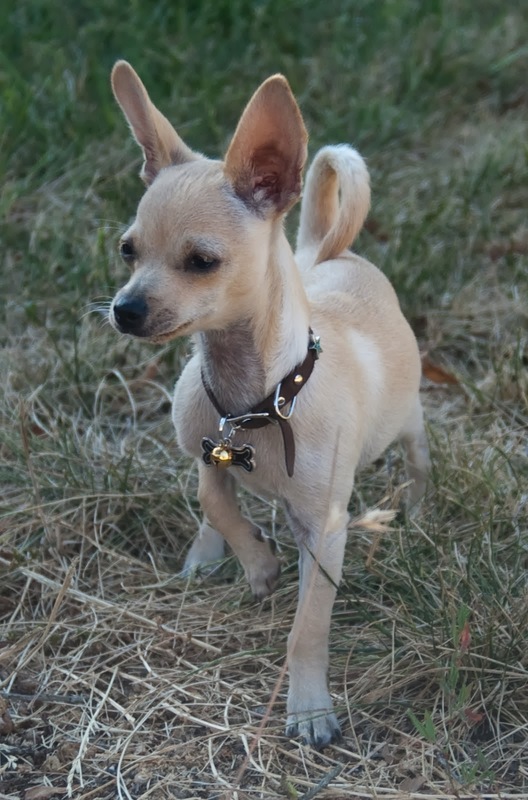 Not Good For: Super-picky chihuahuas. Little girl dogs who need to contemplate everything before they eat it. High-value training treats. How Much We Like Them: Enough to lick them, apparently. They're really quite bland. Obvious I have to keep her. She is the dog I wanted when I got Brisbane ten years ago. The dog who can do all the dog sports. I couldn't have handled her back then though. Brisbane was the dog I needed at the time, the dog who wouldn't tolerate any mistakes and forced me to become a better trainer in order to meet his needs. His physical limitations have taught me to listen to my dog and put his health and welfare over my own desires to compete. 1. Structurally sound, athletic, and built to handle high-impact activity with minimal chance of injury. 2. Full of unstoppable drive. I wanted a dog just as intense as Briz. dog I could comfortably haul around. 4. Bouncy. I wanted a dog that could jump high enough for me to catch. Several of the dogs at work do that, and I think it is the most endearing behavior on the planet. 5. Female, because I felt Brisbane would be more likely to get along nicely with a girl and it's important to me that he not just tolerate his housemate. 6. A blue cattledog. I always wanted a blue heeler. I wanted a blue when I got Brisbane, but fell in love with him instead. This time around I was totally going to get a blue. Sisci fits everything on that list except for color, which is obviously the least important. At 11 months old she is a brilliant, high-energy, super-drivey, super-bouncy dog that jumps onto a 3' platform as easily as she hops over a 6" jump. She picks up new skills and tricks almost as fast as Brisbane, and is entirely too much fun to train. Best of all, having someone to take turns with makes training way more exciting for Brisbane. She's not that great with people yet, but I already have a decade of experience working with a reactive working-lines cattledog. Sisci is the dog of my dreams, and she has come along at exactly the right time. At ten years old, Brisbane has a few years to teach her how to be the best dog ever. I know his time will come eventually, and I'm glad to have his help training his successor. Sisci just fits.